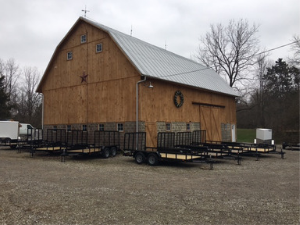 Riverside Trailer Sales, LLC is located in Powell, Ohio, in front of the Scioto River, four miles north of the Columbus Zoo. Our experience in the trailer industry spans over forty years. Our trailers are national known brands that focus on details in quality. RTS offers trailers with many features being standard without extra, out of pocket, charges like on most new trailers. Our trailers are equipped with new, state of the art LED – SMD technology, gasket sealed oval tail and marker lamps. Trailer LED lamps are much brighter, have a substantially longer life, and most importantly you will not have the hassle of replacing incandescent bulbs. Our trailers are competitively priced and we'll treat you with respect to earn your business. Our philosophy is to give our customers the same service as we would like to receive – something that's often hard to find in today's retail environment. Be safe on the road and happy trailering! P.S. You’re more than welcome to bring your fishing pole and walk down to the river bank to try your fishing skills but don’t forget your Ohio fishing license. Take time out to relax and enjoy life because you never know how much time we have on earth.